Paul Sullivan, chief guide/owner of the Burbank Guide Service, has designed another winner! After seeing the increased results with custom goose decoys (DropZones), he decided he wanted a quality duck decoy for Paul’s Ponds. and have it work every time! I couldn't find a versatile quality decoy, so I made my own." All the features you ever wanted! Naturalist shaped. The feather patterns are exact (traced onto each body). The the carver gently carved minimal relief, for natural look. Have the best looking duck decoy spread ever! Be the envy of your fellow hunters. Experience the DropZone™ effect! Ducks just drop right into your spread. Removable keels enable you to change with the weather or location. Remove the keels for ice or field use.. Early season or late, you'll only need Full Curls! Custom decoys, at a price you can afford! Look of Cork, without the cost. Enhanced features to improve performance & decoy life. 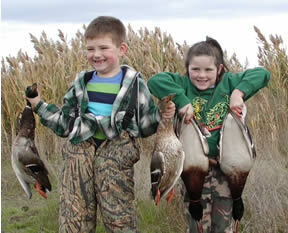 Click: honkerguide answers duck decoy questions. Use on the water, water edge or in the field! True Paint colors - no shine (shine flares birds). Varying the swivel heads adds extra realism to your spread. The feeder also looks great as a preening decoy! Look of Cork: Textured surface has the same look- eliminates the shinny paint/plastic finish found on there decoys. Flocking: Reflects light like real feathers! Black/white on tail can bee seen from great distances. The green on the head is a mixed color and hand airbrushed/shaded (painted) for extra realism. Success: Late season wary ducks respond to true realism. .Full Curls make the critical difference! Swivel the heads add spread variety. Increase realism. <----- New 2010 Paint scheme. Improved paint hues and added details, especially on the hens. Content, not alert, rides better in wind. Hen has same head size/shape, as the real duck shown below. Hen's have smaller heads than Drakes, in real life! Right Look: Great profile for visibility and new textured -no shine paint finish! We have proved that the textured surface is the right finish for true realism in the Elites (goose decoys). Finally the Right Colors and right paint scheme. Oversized, or Magnum-size of real fat grain-fed Mallards - gets the ducks attention from greater distances. Improved visibility increases the decoying effect. See in the picture how the size and colors match the real Drakes! Body width, height and overall bulk is greater than most decoys. Right flock mix: Original 6 pack has 6 different head positions. More active head positions adds life to your spread. Adjust the heads for increased realism in the spread. By turning the feeding head it will become a preening duck. Works great on fast water or quite water. Remove keels for ice & fields. Remove the long lasting rubber plug and fill the chamber with sand (or water fill/empty) to improve the ride on the water. Filled keels will also enable the decoy to right itself when tossed into the water. The decoy line can be secured on either end of the keel. Additional hole for 'gang' set up. Slot in keel for strap weight storage. Do not wrap string around the decoy head. Quality Look. Drakes have flocked shaded GREEN heads and flocked tails (black/white). Flocking emulates real feathers. The sharp contrast of the true black and white on the drake is hard to achieve with paint. Flocking last longer than paint. Plus the multicolor green flocked heads change colors just like a real duck. This eliminates the bright green in sun that does change to appear darker in the shade, like a real drake. Plus the flocking offers a no shine surface for added realism. The hens are not flocked. Quality Investment: Foam filled will enhance the life of the decoy and eliminate loss of decoys- no more sinking decoys. The next generation will thank you! Built to last. Hen Heads- Booth feeders. Up is not shown. Fewer more realistic decoys are extremely deadly! Give the ducks a 'new look'. Especially effective late season on decoy wary ducks. No other decoy has all the quality look or features of the Full Curl. Inexpensive decoys quickly loose their impact in the field. They break, parts get lost and most do not have the versatility of removable keels. You can count on passing these on to the next generation. Care: Transport in individual heavy duty plastic bags to extend the paint and flocking or in bags with pockets with very smooth surfaces to not abrade the surface of the decoys. Also best to place a HD plastic bag over the heads, when caring in pocketed bags or ponchos. For long or rough transports make sure the decoys are protected. Do not toss loose in 1 bag. Pick up the decoys after each use. Store in a dark, cool place after they have been cleaned and dried. Clean: Use mild dish soap diluted to just give a little bubble. Hose off and dip brush in mixture and lightly brush to remove dirt. Dry and store. Decoy Bag: Check out the new Aero Decoy Bags and Poncho. Best to always slip a plastic bag into each pocket to ensure protection for the finish. Protect your investment for success! Design: All of Paul's efforts have paid off. His attention to detail when working with the carver, assisted in bringing another successful decoy to the market. Paul has insisted upon getting the decoy and finish just right. He had perfected the texture finish on the Elites, and is using the similar process on the new Full CURL Decoys. Note: Most other decoy manufacturers measure from the tip of tail to tip of bill, or just from tip of tail to front of body. Standard decoys are smaller than the body of our decoys, plus they do not have the strong profile of the Full Curls. Aero's carver did an excellent job of rendering an exact reproduction of ducks, on the two decoy bodies (hen & drake). All of the poses were meticulous reproduced from actual photos and measurements of real ducks. He is an award winning carver, but has chosen to remain anonymous. Buy early. Limited production. For the extra edge on SUCCESS, Buy FULL CURLS! Great price for the extra realism, foam filled, flocking and versatility = success !! !